Can you freeze blueberries? You sure can! This easy step by step photo tutorial on how to freeze blueberries will show you how. It can be such a great way to save money and enjoy blueberries all year long! It’s currently blueberry season around here, so we’re enjoying lots of fresh, juicy blueberries. I’ve been having fun making some of our favorite blueberry recipes and trying a few new ones, too. So yummy! And of course, since I’m a fan of preserving produce, I’ve also been busy freezing blueberries to enjoy all year long. The great thing about blueberries is that they are super easy to preserve and they are almost just as delicious frozen as they are fresh. In fact, some of my family actually enjoys them more frozen! We also use them in smoothies (peach/blueberry is our favorite), and frozen blueberries work wonderfully in most blueberry recipes, too. I like to watch for good sales on blueberries when they are in season and then buy large quantities of them to freeze. It’s a great way to save and is pretty much always cheaper than buying frozen blueberries, too. Of course if you have the option to pick your own blueberries, that’s even cheaper! 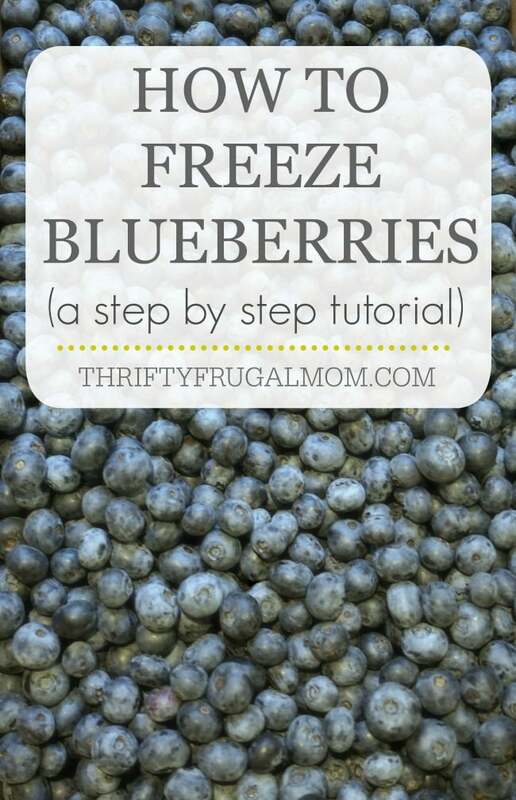 Want to try your hand at freezing blueberries? Let me show you how. You’ll love how super easy it is! 1. Pour blueberries into sink or dishpan and cover with water. Swish around and rinse. A. You can dump the drained blueberries onto a cookie sheet, making sure they are single layer only, then flash freeze for at least 2 hours before going to step #4. B. You can dump the blueberries onto a towel and gently pat dry before going to step #4. C. You can keep things super easy and be lazy like I am and simply drain the berries really, really well and then go to step #4. The advantage of option A and B are that the berries almost never freeze together. Some people feel like that is important and prefer doing the extra step of A or B. However, since we typically use our berries in smoothies or for eating frozen by themselves, I keep things simple and do option C. The random times that I end up using our blueberries for baking, I just carefully pull apart any berries that are frozen together then. It’s easy to do then and only takes a few extra seconds and I feel like the extra hassle saved is worth it! 4. Transfer blueberries to freezer bags and remove as much air as possible. Freeze! Alternatively, you can freeze your blueberries in freezer containers like I do instead. I love the Arrow Plastics StorKeeper freezer containers and highly recommend them! They stack nicely and you can use them over and over again for years, so they quickly pay for themselves. We’ve felt like they’ve been a great investment! Have you ever frozen blueberries? What is your favorite way to use them? Yum! I love blueberries and my kids love them too. Thanks for the tips and for joining the Family Joy Link Party. I have been told not wash my blueberries before freezing, it better to wash when you need them. That came from an ag extension officer. University of Georgia puts out a book about all type of canning and freezing. I'm sure you can do it that way too. I just prefer to have them washed and ready to use since it really speeds up any kind of food prep later- which is huge for me! I know a lot of people love laying the blueberries out in a single layer to freeze...I'm just too lazy to bother with that step! :) And that jam sounds amazing! Yum! I love that it's so easy and for a jam, healthy too. Thanks for sharing it!